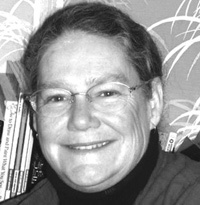 Based in Victoria, Bev Cooke is the author of two children's novels. Feral (Orca, 2008), and Keeper of the Light (Conciliar Press). She was born and raised in Scarborough. Little Cat meets the street kid Candlewax, "as agile and careful as any cat,"; who tosses Little Cat a chunk of Egg McMuffin. Candlewax steals candles from the church where he hides out and hawks them on the platform. and blows of the two-legs and faces down rats, evil-fanged dogs and other, bigger, viciously territorial cats. Candlewax, or Con as he calls himself, has escaped a "worms-in-the-head bad"; gang leader only to be targeted by a rival gang. The old gang Nightside will kill him if he goes too deep into the tunnels. Katherine, herself involved in the gangs through a shifty, untrustworthy boyfriend, befriends both Con and Little Cat and then unknowingly unites them for the chilling climax of Feral, the second children's book by Cooke who, not surprisingly, is a cat-lover.